Bonn, 9 November 2015– Waterbird populations across the African-Eurasian flyway are on a downward trend, with declining populations outstripping growing ones by almost 50 per cent, shows the latest conservation status report compiled for the Agreement on the Conservation of African-Eurasian Migratory Waterbirds (AEWA) – an inter-governmental treaty administered by the United Nations Environment Programme (UNEP). However, the report also shows that the populations subjected to active conservation measures generally fare much better, with 45 per cent of them declining, compared to a staggering 83 per cent decline in populations not covered by active conservation measures. The 6th Edition of the Report on the Conservation Status of Migratory Waterbirds in the Agreement Area, prepared by Wetlands International, is being presented to delegates attending AEWA’s 6th Meeting of the Parties, held at the United Nations Campus in Bonn, Germany, between 9 and 14 November. The meeting is bringing together over 200 participants from more than 70 national governments, intergovernmental organizations and non-governmental organizations. The inter-governmental meeting underway in Bonn is focusing on waterbirds that regularly migrate along the African‑Eurasian flyway - a bird migration system stretching from Northern Russia to Southern Africa. The delegates will look for ways to strengthen conservation measures and agree on urgent responses to themanythreats facing migratory waterbirds in the African-Eurasian region, such as habitat loss and degradation, illegal killing, bycatch and overfishing. The meeting will also focus on measures to help mitigate negative impacts of energy developments and climate change. AEWA’s Action Plan provides a blueprint for what needs to be done to maintain and restore migratory waterbird species and their populations at a favourable conservation status. The international guidelines and the targeted action plans developed under AEWA are proving to be effective tools, but only where they are being implemented. The meeting is taking place a few days after the release by BirdLife International of the 2015 Red List update for birds, which saw 40 more species listed as having a higher risk of extinction globally. Twelve of the uplisted species are migratory waterbirds covered by AEWA, of which three, the Atlantic Puffin, Common Pochard and Horned Grebe,have seen their status raised to the Globally Threatened category. “Further investment and more concerted actions on the ground and between countries are necessary if we want to halt the continuing decline in migratory waterbird species in the African-Eurasian flyway in the years to come,” said Trouvilliez. 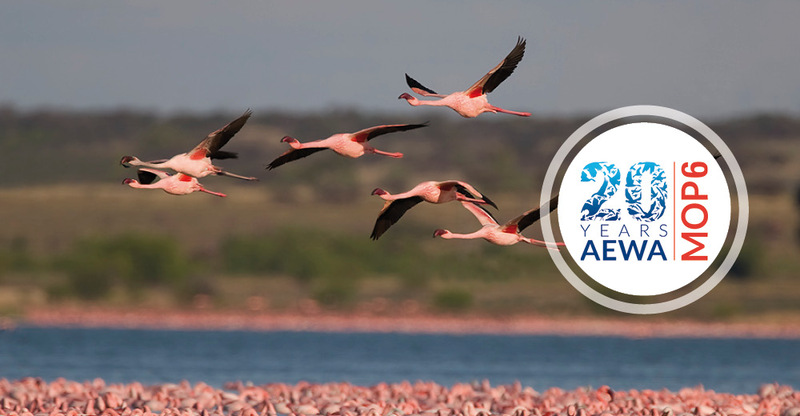 The conference is being held under the theme “Making Flyway Conservation Happen”, which highlights the importance of AEWA as a treaty fostering international cooperation for the benefit of migratory waterbirds amongst a vast range of countries in Africa and Eurasia. The year 2015 also marks the 20th Anniversary of AEWA. The development of guidelines, implementing emergency measures for the most endangered species and the development of international single species action plans as well as the adoption of a targeted Plan of Action for Africaare some of the key achievements of the relatively young international treaty to date. The Agreement on the Conservation of African-Eurasian Migratory Waterbirds (AEWA) is the only inter-governmental treaty administered by the United Nations Environment Programme (UNEP) dedicated to the conservation and sustainable use of migratory waterbirds - such as pelicans, cranes, storks, terns, ducks, geese, waders and flamingos - as well as their habitats throughout their range. With currently 75 Parties out of 119 Range States, it is the largest regional instrument of its kind developed under the framework of the Convention on the Conservation of Migratory Species of Wild Animals (CMS, also known as the Bonn Convention, after the city in which it was signed). The decision-making organ of the Agreement, which convenes every three years, reviews the implementation of the inter-governmental treaty. At MOP6, governments will decide on urgently needed conservation and management actions in an effort to ensure the long-term survival of the 255 migratory waterbird species covered by the Agreement. Conservation Status of AEWA Species: the latest Conservation Status Report (CSR) being presented reveals that many populations of waterbirds continue to decline within the AEWA region. However, the report also shows that some populations are benefitting from coordinated conservation measures under AEWA. International Single Species Action Plansfor the Shoebill, Grey Crowned Crane, Taiga Bean Goose, Long-tailed Duck, Northern Bald Ibis and the Eurasian Curlew will be presented for adoption. Focus on Seabirds:Two reviews on seabirds, looking at status, threats and conservation priorities as well as on the impact of marine fisheries will be presented. In addition, a first AEWA multi-species action plan for seabirds involving Angola, Namibia and South Africa will be submitted for adoption. Sustainable Harvest of Waterbirds: Revised international guidelines on the topic will be presented, which provide advice on how countries, both individually and collectively, can ensure that harvesting of migratory waterbirds is sustainable. Renewable Energy and Migratory Birds: Guidelines to mitigate the negative effects of energy deployments, including the impact of renewable energy installations on migratory animals, amongst them waterbirds, will be presented. Waterbird Conservation in Africa: Building capacity for waterbird conservation while improving the livelihoods amongst local communities in Africa is one of the key aims of AEWA’s African Initiative. A fundamental question is, how can development be reconciled with the conservation of birds and habitats? Enhancing synergies among biodiversity-related Multilateral Environmental Agreements (MEAs): In particular between AEWA and CMS: Promotion of synergies and close collaboration among biodiversity related MEAs on programmatic and administrative issues contribute to the efficient implementation of the goals of the MEAs, including of the AEWA Strategic Plan, and enhancing synergies between AEWA and CMS for mutual benefits.